Back in the 1970s busbars were flat strips of copper that panel builders bought and installed in LV (low voltage) switchboards. In the 1980s mounting holes appeared and busbars were current-rated. But lining up the holes could make installation time-consuming. Accordingly the 90s were the decade of busbars with extruded profiles that were lighter, and easier to mount. With the millennium came aluminium and big manufacturers made vertical profiled bus bars from aluminium with different current ratings – 630A, 800A, 1000A, and so on. Today? The latest development is aluminium horizontal profile busbars that connect vertically with a wider range of current ratings. Why the rise of the bus bar? The humble busbar has evolved in the last 50 years. In the last 10, I reckon it’s safe to say, it has supplanted hard-wired power distribution in industry. One reason for its rise is the rise of aluminium. And the rise of aluminium is due to its low cost in today’s fiercely competitive markets. Recyclable aluminium is not prone to scarcity or the fluctuations of commodity markets. It can secure savings as high as 35%. Inherent advantages of aluminium for bus bars? It’s much lighter than copper – up to 70%. And it’s soft. I like to compare it to pasta. It is squeezed through a die cast like pasta through a mould into all manner of customised designs and shapes – flat, hollow, and extruded. A single operator can install busbars made from aluminium quickly and easily because they’re so light. And with their customised profiles, they slide or dovetail securely into position. How do aluminium busbars handle heat? 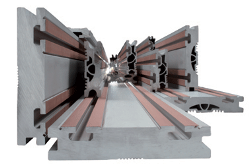 Hollow and extruded profile busbars have a larger surface than standard rectangular sections. So there is greater heat exchange and more efficient thermal dissipation. In a cramped enclosure that’s a powerful advantage. You can actually have your busbars extruded to enhance natural convection – one of the three ways that heat can be dissipated. A long, thin busbar with additional fins improves the mix and flow of heat and air, for example. Altogether, today’s aluminium busbars are pretty cool with heat – temperature rises of 60°C above an ambient temperature of 35°C are no object. With their hollows and protrusions and ionised surfaces, they optimised heat dissipation dissipate heat and reduce resistivity. Resistivity? Whenever I hear that word I think of its opposite, conductivity. Are aluminium busbars really as conductive and rugged as copper? Yes. Some say aluminium is only 65% as conductive as copper. But is it? Sure, for the same current rating the cross-section area of an aluminium busway is greater. But it’s much lighter. In fact, kilogram for kilogram, aluminium busbars are 50% more conductive than copper. People say: “aluminium busbars can’t withstand electromechanical stress”. But do they know that the tensile strength of aluminium busbar can withstand currents of 4000A? Or that good, high-strength aluminium alloys have mechanical resistance of up to 530 Newton/mm². That’s ample to take the strain and pain of thermal expansion. What about it? Tin plating bars at bars’ joints solves the problem. Better still is silver plating. It’s tougher and further improves conductivity. Actually, copper, too, sometimes coats aluminium bars. It’s the ideal contact strip. So, let’s not get carried away. There’s no pitched battle between “copperites” and “aluminiumists”. It’s just that in this cost- and environment-conscious age, aluminium is asserting its inherent properties. Linergy Evolution Busbars by Schneider Electric. Patented Linergy Evolution busbars use a supersonic high-temperature coating process, unique on the bus bar market, for a robust copper contact surface.The revolutionary design offers innovative and high-quality copper contact strips, anodized aluminum surface, and unique shapes. Many people understand the cost difference between the two, but they do not have personal experience with equipment with aluminum conductors and are hesitant to change. The equipment manufacturers only make what the customer requests. Many consultant specifications and end user specifications require copper only conductors throughout their projects. Some of these specifications could be relics from the time when aluminum conductors in equipment was not the best choice or the people producing the specifications are not informed of the actual differences and similarities between aluminum and copper conductors. When the equipment is designed to the applicable industry standards, the performance of a piece of equipment should be identical whether the internal conductors are copper or aluminum. Most importantly, the designer should be aware that equipment available with aluminum conductors will definitely weigh less than the same equipment with copper and at the current commodity pricing will cost less. At the same time the designer should be aware that there might be a physical size difference. The environment in which the equipment is installed may also dictate the conductor material and plating requirements. All of these factors should be taken into account when the decision is made between copper and aluminum conductor material. Either material will meet customer expectations when designed to industry standards and installed correctly. We have definitely seen a rise in aluminium busbar being specified for sites. Although copper is still king at the moment. One reason we find people choose aluminium over copper other than cost is due to theft. It is simply not as lucrative to the metal thief as the more expensive copper earthing options. A very interesting article and I have certainly learnt something from it. Thanks! Completely agree with your comment, Sridhar. We construct bus bars according to our clients requests. Before we can issue a quote we specifically have our customers fill out a form that accommodates for all unique requirements of their system to determine the best fit for them. what is material composition of al busbar. Thanks for sharing the quality information about busbars. what is the characteristic of a good aluminum for busduct? what is the best manufacture of aluminum for busduct?